After a tree went through my roof almost 8 years ago, I got a new roof (2004). It just started leaking last week when a piece of the flashing that was not installed finally started leaking through the felt paper that was installed. My question is how do I flash behind the siding at the peak of that gable? My chimney is missing a piece of the flashing below the peak of the gable, but I when i remove the siding to reflash the lower missing piece, I may have to replace that peak flashing as well. What shape does that flashing need to be? I know it needs to go up the chimney 3-4" and back 2-3" under the shingles..but how do I make that shape with the flashing material (aluminum)? I know the piece you are after but personally I know of no such piece, then again I'm not a roofer by trade. I know if the roof was mine and I was doing the work I'd either make a piece (if I couldn't buy it) or I'd use the typical step flashing up to the ridge and then I'd put a piece of water and ice to seal off the peak. You could probably get away with a sandwich of tar, tar paper and tar. ? If I were to make something up I'd use a couple of step flashing pieces and solder them together. The important element to remember in flashing..water runs downhill! Silly as it sounds, many "roofers" still have uphill laps (against the flow of water), and try to seal them with bull (canned roofing tar). 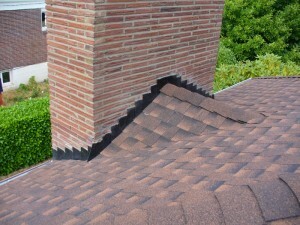 Flashing should start at the bottom and work to the top so the laps naturally don't leak. Don't use aluminum, don't use silicon. I've never seen an exposed felt paper flashing. the best way to make the top piece, is to remove the lower pieces of siding and trim, exposing the plywood sides and the shingles. hand form a piece of lead flashing aproximately 8" wide over the peak and up the sides, take your time and go slow , it will form to the area.I ran a roofing company for 30 yrs, this is how i was taught 45 yrs ago, always works, never leaks if done correctly. It was exposed because the roofer never covered it. Its about a 2"x2" piece of tar paper (now hole) that somehow made it almost 8 years without leaking. Can I even buy a piece of lead that size? Remember...I'm not a contractor, so it will be from Lowes or HD. That does look like it would work. I was looking at that one Joe and never posted it up because at the end of the day there is still that little hole that needs to be tar filled. I said the solution was good, but it was not the complete answer. The lead should be available at a GOOD hardware store or lumber yard. and he's right about those 2 pieces leaving a small hole that needs to be tarred. if you go that route I would recomend placing the tar behind the pieces and pushing them into it and then a small amount over the outside. Needs to be counter flashed. When I was building I'd take a 2x6 or 2x8 depending on the height of the step flashing above the roof and lay the 2x6 on edge on the roof along the side of the chimney. Then with a diamond blade in a circular saw gut a parallel to the roof groove about 1+ inches into the masonry using the 2x6 as a guide. Then fabricate a piece of copper or lead coated copper counter flashing in a brake and with metal scissors, make sure it fit then apply masonry cement or silicon into the groove and install the counter flashing over the step flashing. What you call a gable is actually known as a "cricket" at least in these parts it is. View Next Unread what 1911to buy?